During Holy Week, we priests will have the opportunity to attend the Chrism Mass. We will gather with our brother priests around the bishop and will renew our promises. I'd guess that no matter where any of us is in our spiritual lives, there is a sense that we could be closer to the Lord. We could all be better priests. We could be holier than we are. For some of us, the Chrism Mass is is a reminder that we are part of a great fraternity that has its foundations in the apostles. We are brothers who participate in the one priesthood of Jesus Christ. For others, the Chrism Mass is a source of some sorrow. It is a reminder that the fraternity that we entered is weak and marred by the sinfulness of its members. For many, perhaps it is a mixture of both sentiments; it contains both joy and sorrow. No matter whether one arrives at the Chrism Mass filled with joy, with sorrow, or with some mixture of both, one thing is certain: None of us priests (or bishops) who attend has lived up to our noble calling. We are all, as St. Paul says, earthen vessels. In the line of penitents, the clergy ought to be given pride of place. In other words, we who are ministers of the Lord's mercy ought to recognize ourselves as those most in need of that mercy. One of the many blessings that the Lord has bestowed on me in my life is that I've always been assigned in places that are proximate to shrines and chapels where confessions are frequently offered. Additionally, I've been blessed to be assigned with priests or have had good priest friends with whom I've always been comfortable to ask, "Before we go out for dinner, would you hear my confession?" Oftentimes when I preach about the importance of going to Confession, I mention that I go to Confession. I do so because I think it is important for people in the pews to know that their priest knows what it is like to be a penitent. In fact, the other day I went to Confession to a local chapel and I mentioned to someone that I went. They said, "Did you get Father so-and-so?" I said, "Yes! He was a great Confessor." The young person with whom I was speaking said, "Yeah, I love to get him. He's so good." I'm glad that the people whom I serve know that I preach about the importance of Confession not simply as one who hears Confessions, but as one who needs and receives the Sacrament. Not every priest lives near a Shrine or a Chapel that offers regular Confession times. Not every priest--for whatever reason--is comfortable confessing to his friends. Not every priest has a regular confessor or spiritual director. Not every priest is going to Confession regularly. And then, like every other Catholic who lets it go too long, even priests can become hesitant to go at all. He becomes embarrassed or afraid. Because he is a priest, he feels even worse for not having gone to Confession. He allows Satan to shame him into silence. This silence becomes an obstacle to the fruitfulness of the priest's ministry. I just want to say to my brothers in the priesthood that if this week you go to the Chrism Mass, take the risk. Even if you've been to Confession recently, why not go again? Why not enter into the Triduum with as much grace and purity as possible? And if you haven't been in a long time, what an amazing opportunity! Show up early and ask a priest friend. Or, ask some retired priest who probably doesn't have much opportunity to hear confessions. Or, ask one of the religious order priests who are present or one of the priests from some other country who happen to be present at the Mass. Ask one of the priests whom you know to be a holy priest or one of the priests who you think could benefit from being asked. No matter what, we are all showing up at the Chrism Mass and are going to renew our priestly promises. We are at the threshold of the Sacred Triduum. We ourselves are about to hear scores of Confessions, Baptize new Catholics, Confirm new Catholics, and give new Catholics the Eucharist for the very first time. Deep in our souls, we desire to be holy. We want to do these things with as much humility, purity, and charity as possible. 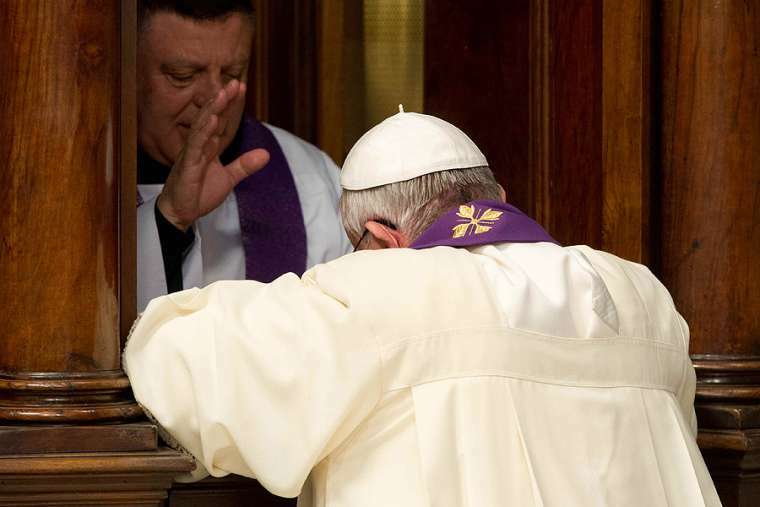 So, why not use the opportunity to be recipients of the Sacrament of Penance? I'll be attending the Chrism Mass in my archdiocese. Even though I've been to Confession this week, my guess is that I will be asking some priest before the Chrism Mass to hear my Confession. If I do, I'm guessing he would be edified and thankful for the opportunity. I hope that if you're a priest and you're reading this, you might also seize the opportunity to go to Confession during Holy Week. You need it as much as your people do. And, Jesus loves you as much as He loves your people. He loves you, He knows that you are sorry for your sins, and He wants you to share in the riches of His mercy. You will serve your people better if you allow yourself to receive the Lord's forgiveness. I hope none of what I've written sounds the least bit condescending. It just bothers me to know that there could be a brother priest who, deep in his heart wants to go to Confession, but is afraid. While the banter and conversation before the Chrism Mass is good, we shouldn't allow it to prevent us from approaching one another to receive the Lord's mercy. I write this as a brother priest who also needs the Lord's mercy and as a brother who would humbly kneel before you and say, "Bless me Father, for I have sinned." Good Friday: Do You Live Differently Now?